When you make the decision to transform your backyard into the place where you want everyone to gather to make memories, there are many choices in what features you can incorporate as well as the materials to choose from. 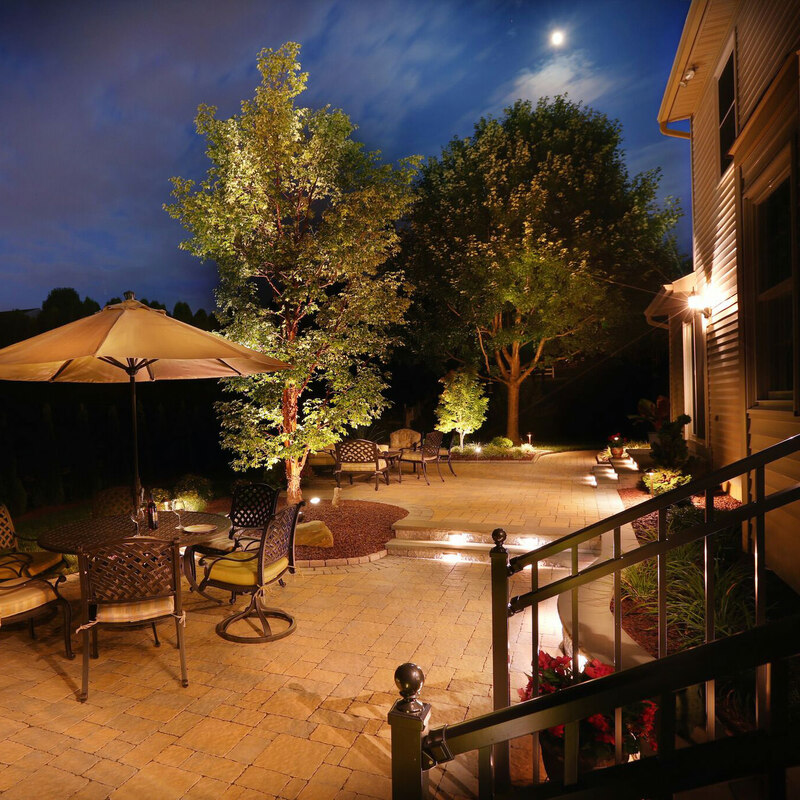 When planning your backyard patio, should you choose concrete pavers or go with stamped concrete? There are many aspects to consider when making your concrete choices, because they will figuratively be, set in stone. 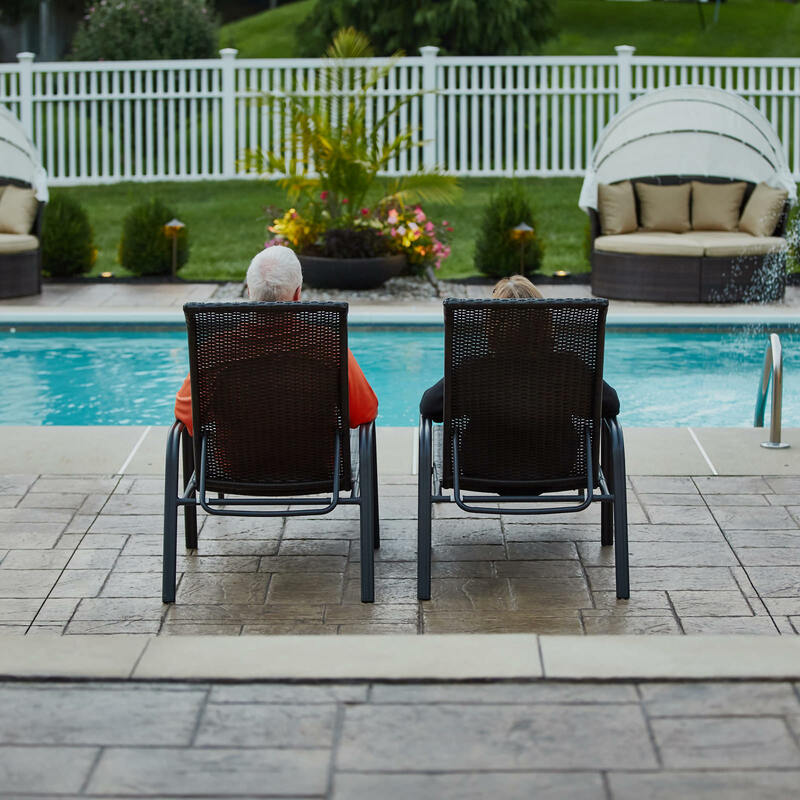 Installing a patio is a big decision; most homes only have one or two installations tops within the life of the home, so it pays to do your homework. Stamped concrete has come a long way from the run-of-the-mill grey slabs that you used to see outside a first floor doorway. The development of stamped concrete has taken those hard, plain slabs and given them a beautiful face lift! Stamped concrete adds value to your home and is aesthetic as well as being a durable and long term solution for your backyard. Aesthetics: You will never suffer from lack of choices when choosing colors, patterns and textures for your patio. Earth tones are the most popular for your patio color scheme. Going with a natural look will be guaranteed to never go out of style or fall out like a fad. While there are many patterns to choose from, your landscape designer will look to your home, and the size of your patio for cohesion and inspiration. Stamped concrete has succeeded in mimicking almost any hardscape surface from slate to natural stone. Installation: Because stamped concrete is one continuous form, it is seen as a less labor intensive option to the installation of concrete pavers. 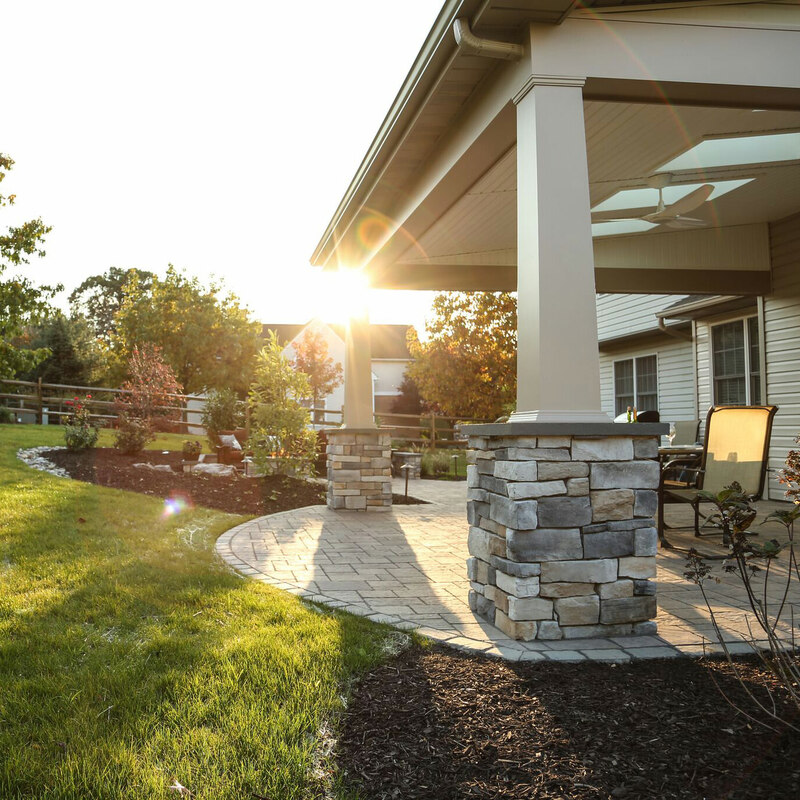 Concrete pavers are hauled and individually placed in a pattern by hand, whereas stamped concrete is mixed, poured and formed by stamp templates. Cost Effective Alternative: Stamped concrete, compared to brick or concrete pavers is an economical way to extend your outdoor living space. While some stamped concrete does not require a seal, some clients prefer a sealed surface, which will give it a wet look but will be protected from the elements and offer slip resistance. With stamped concrete being a more economical choice upfront, if you choose to seal the surface, you will be committed to resealing it every 3-5 years. Maintenance: Because stamped concrete is one continuous piece of concrete, you will not have to worry about weeds growing through the joints, as you would with concrete pavers. Concrete pavers also run the risk of separating and heaving with the freeze/thaw of our winter seasons, but with stamped concrete you won’t have to worry about an unsettled surface. Aesthetics: While stamped concrete closely resembles other hardscape materials such as slate and natural stone, it is still just a simulation. Stamped concrete is an attractive solution for a patio, but it is hardly ever mistaken for the real deal. Cracking: If it has been said once, it has been said a thousand time, is is not if the concrete will crack but when the concrete will crack. Being that stamped concrete is one continuous hardscape without room for movement, the relief joints that are saw cut into the surface are very important. The relief joints are a predicted guideline for the cracks to follow. Not all relief joints can be blended into your stamped concrete pattern. There is a chance that these joints will be obvious within your patio. Color Matching: If for some reason your stamped concrete patio suffers damage and chips, it is very hard to match the original color for your repair. Stamped concrete patios are colored in a phased process when installed, and to recreate that color layering exactly is near impossible. MasterPLAN Landscape Design believes in educating our clients and exploring all solutions for their outdoor living spaces. Every family, home and property is different with their own unique features, so what your neighbor has in their backyard might not be the best solution for your backyard. MasterPLAN cares about the details and aspires to create beautiful and functional outdoor living spaces our clients can be proud of. When you are ready to chat about options for your outdoor living space, reach out to MasterPLAN Landscape Design.